Richa Chadha Finally Beaks Her Silence For Her Role Being Chopped Off Brutally In Sarbjit! 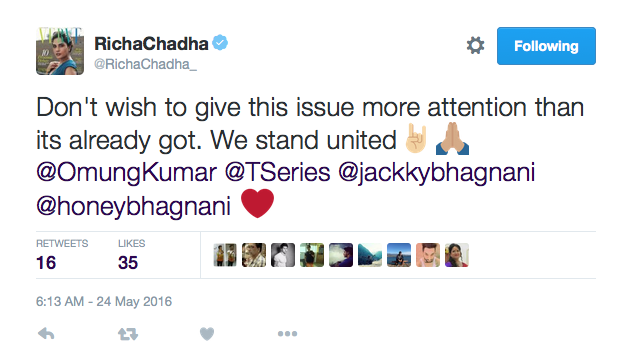 [tps_footer]Bollywood’s actress Richa Chadha is not just known for her brilliant acting skills but she is also bindass person offscreen who can raise and share her opinions and feelings with media, her fans, anytime and anywhere. We have always admired the truth and honesty in Richa Chadha and this time she is giving back to a leading portal for coming up with a story where Richa is showed as if she hated every bit of Sarbjit because her role was chopped off and she only had one engaging scene in this movie. Some reports suggested that it’s an Aishwarya Rai Bachchan‘s movie and many claimed it’s Randeep Hooda‘s movie as their performances have been loved and admired tremendously but not much is said about Richa who is also a part of this movie.